Thanos is about to wreak havoc on the Marvel Cinematic Universe when Avengers: Infinity War hits theaters on April 27, and readers interested in learning more about the mad Titan should seek out the current run on Thanos, which wraps up with next week’s issue #18. 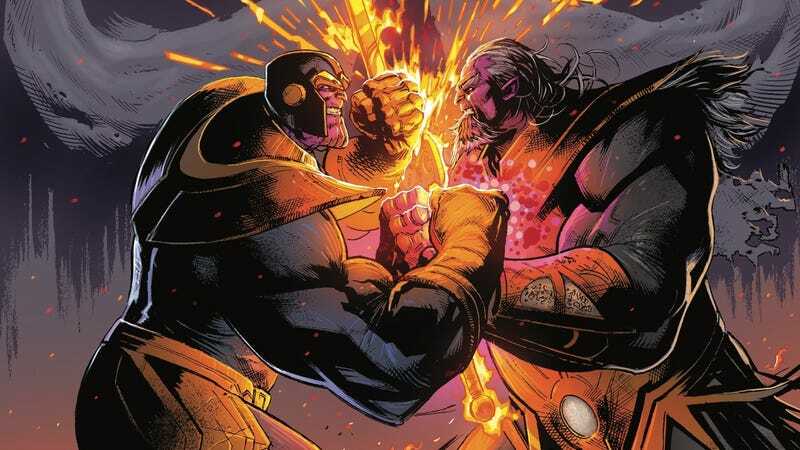 Writer Donny Cates, artist Geoff Shaw, and colorist Antonio Fabela have done exceptional work making Thanos a compelling character by sending him to meet his future self, who has killed nearly everything in the universe in hopes of finally feeling Death’s sweet embrace. The “Thanos Wins” storyline has been a brutal, exciting, surprisingly emotional look at Thanos confronting his tragic future, and after an epic showdown with Silver Surfer last month, the villain is finally reuniting with the woman in black to whom he’s dedicated his life. This exclusive preview of Thanos #18 has Death revealing herself to the two men, and it’s an excerpt that emphasizes the contrast between Death’s coy, quiet demeanor and Thanos’ hulking intensity. That first shot of Death presents her as the bride from hell, standing before smoldering ruins as she lifts her veil to greet her lovers with a sly smile. Cates’ run on Thanos may be ending, but he’s continuing to explore this futuristic landscape in the new Cosmic Ghost Rider series announced yesterday. That series partners Cates with his Interceptor and Reactor collaborator Dylan Burnett to follow Frank Castle, former Punisher/herald of Galactus/right hand man to Thanos, as he tries to create a better universe. We’ve included Burnett’s preview in the pages below, which showcase the thrilling energy he brings to the anti-hero’s continuing adventures. Cates carved out a new section of the Marvel Universe for himself with his Thanos run, and Marvel is making a smart decision by giving him the opportunity to continue expanding on the concepts introduced in this series.